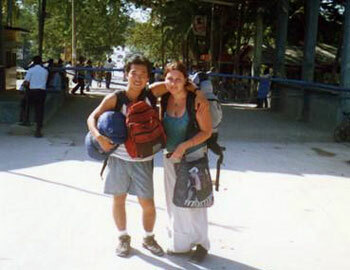 Ten years ago, in November 2001, I flew to Mexico to meet a guy I briefly study with when I was in Beijing in 1999. He was Canadian, I was French. We had stayed in touch by email between 1999 and 2001. 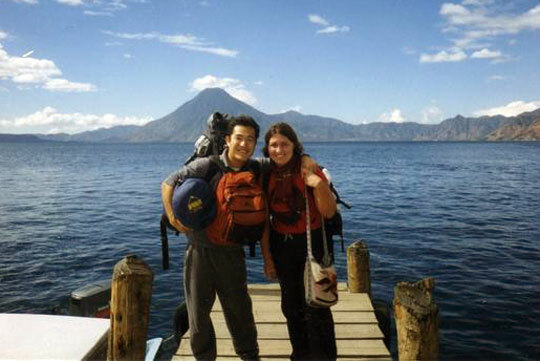 In fall 2001, he was about to embark on a trip from Mexico to Brazil by bus and had asked if I wanted to come. I had just graduated from high school and I had just completed my first work experience in Hong Kong. I was free. I wanted to travel. I had never been to the Americas. “Sure,” I said with as much confidence as I could muster. That guy was Feng. He picked me up at the airport in Mexico City. My plane was late, I barely spoke English and he didn’t speak French. I was jetlagged and he had a cold. I was 18 and I wanted to travel the world. I was on my way of becoming a travel junkie. I had told my parents I was going to spend a couple of weeks in Mexico. I came home four months later after backpacking through Central and South America, and after coming back to Canada with Feng. Ten years later, Feng and I are still together. I moved to Canada, became a Canadian citizen and we have explored dozens of countries together. This time of the year has come again. After an exciting and busy year work-wise, I need a break, I need my freedom back. A new beginning, maybe. I’m still a travel junkie. I’m afraid there is no cure for it. On December 14, Feng and I will land in Cancún, Mexico, for seven weeks of travel. As usual, we have no defined travel plans. We will go wherever the chicken buses will take us. This will be our third time in Mexico and Central America. The last time we were here was in 2003-04, right before I moved to Canada. I’m curious to see if it changed. Follow us on the road… Welcome To The Jungle! Oh quel bel article ! Je suis émue de voir que cela fait si longtemps que cela dure entre vous ! Et je suis aussi heureuse que vous repartiez : après avoir lu tous tes vieux messages, je vais enfin pouvoir suivre un Zhu travel “en direct” ! Avec Ben, cela va faire 8 ans. On s’est rencontrés jeunes, aussi. Et on prend le chemin inverse que vous avez pris : après avoir réuni un peu de sous, on commence enfin à voyager un petit peu, et inch allah, le backpacking viendra bientôt ! Je vais mettre le blog à jour pendant le voyage, on embarque toujours un mini-ordinateur. I hope it will be a good trip! What a wonderful story – and what a wonderful way to lead your life! It’s not always easy to make everything work in life but I try! Oh wow Zhu, Happy anniversary… and what a great way to celebrate it! I’m looking forward to your stories on the road! Thank you! I’ll update the blog while on the road. I have always wanted to ask you how you met Feng 🙂 This is such a perfect love story and I wish both of you well. This is what life is all about…exploring things and travel together, it need not be any fix rules or plans and that makes you happier too. I am ‘stuck’ and it is not perfect picture for me at the moment but I take it in my stride. I also feel stuck once in a while, life isn’t always easy… but you gotta keep on trying! I knew it! I have been waiting for this post. I figured, “Hmm, it’s that time of the year, when you would be escaping the winter. I wonder where you will head to this time.” And voila, Central America! Curiously enough, I will be in Guatemala for 19 days, from January 11 to 29. Who knows, you might be nearby? It would be really funny if we get to meet up in Central America, instead of in Ottawa! Cool! Are you going there for holidays? Where about will you be? Yeah, I am gonna be there for backpacking. I need some time off my dissertation, or else I will go crazy. I have no set plans: just ideas. I intend to climb some mountains and volcanoes, and see Tikal. Perhaps cross over into Honduras for a little bit to see Copan. That means I will spend much time in the highlands, along the stretch between Antigua and Quetzaltenango. If I have more time, I would love to go caving in Grutas de Candelaria, but at this point, I am just playing it by ear. Cool! That’s a nice break from the winter, although the highlands can get a bit chilly. Ever been to Antigua? I love that city! I’ve never been to Guatemala; this is my first time. And yes, Antigua is in my list. I am going primarily for climbing and other outdoors stuff. Oh, plus Tikal! I’ll email you on my location when it gets near: if we’re close, we can meet up! And I’m sure it changed too… it’s been a while since we were there! mexico has always been an exotic land to me… the pyramids, the lush jungles, the beaches, the myths, the volcanoes, the conquistadors – gosh, i can’t wait for my next travel date to come! I always said I wouldn’t shoot destination weddings because I don’t want to work while travelling, but as a favour to someone I accepted a wedding in the Mexican Maya. It’ll be just before my birthday trip, so I negotiated to be at the resort the minimum of 3 nights (or they must pay the resort an $800 fee for using an outside photographer), so I can make my birthday trip longer. Everyone thinks I’m crazy for reducing an all-expenses paid week at a five-star resort to just three days (for the same price). What a wonderful story! Amazing that you and Feng kept in touch for 2 years, then met up in Mexico and are still together 10 years later. Have a wonderful time in Mexico, I look forward to reading about your adventures. We kind of make travelling a priority… it’s a headache sometimes to find the time off but crossing fingers, we make it happen! Oh that’s cool! Mexico City is a fun place, been there a couple of times. Lots to see, for sure!